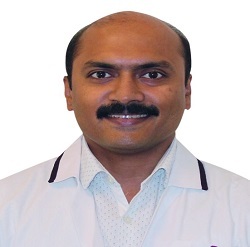 Dr Jayakeerthi Yoganaraismha, is an established Cardiac Electrophysiologist. He is an astute clinician with keen interest in academics and a contributor to the medical education in his speciality. His accomplishments include >1000 successful procedures of radiofrequency ablations and pacemaker implantations including defibrillators and heart failure devices. He has a track record of procedural safety and commitment towards his patients. He has done his post-graduation in Cardiac Electrophysiology and Pacing (PCEP) from Belgium, under the tutelage of Prof. Pedro Brugada (of Brugada Syndrome fame), which led him to practice Electrophysiology at the highest standards. He is European Heart Rhythm Association (EHRA) certified in Electrophysiology. Dr Jayakeerthi’s thirst for academic progress and a keen interest in helping the sick, led him to achieve a second sub-specialisation, in Heart Failure which led to the post-graduation (PCHF) from the university of Zurich, Switzerland. He has obtained training in cardiac transplantation and artificial heart management from Germany. This was followed by the distinction of European Society of Cardiology (ESC) certification in Heart Failure. In fact, he is the first and only cardiologist to hold a post-graduation in 2 sub-specialities. He is “B-Braun scholar 2007”Award Winner and Torrent Young Scholar Award- National 2nd- 2008”.